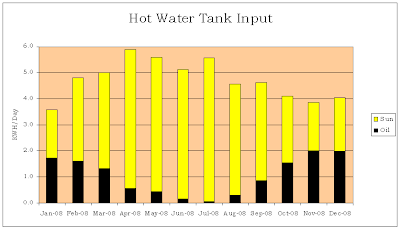 We've just had our first calendar year of solar thermal water heating, and courtesy of our instrumentation, I have the spreadsheets to prove it! Our system, installed in November 2007 by Llanisolar, has functioned flawlessly. So does our system do what the manufacturers say it should? Yes, it does. In gross terms, the panels delivered just over 1700kWh to our hot water tank over the course of the year. But it would be an exaggeration to say that they replaced 1700kWh of oil input, and thus 200 litres of oil we would otherwise have burned. The net output, which is in any case difficult to calculate, is a fair bit less than that, and the discrepancy poses problems for anyone challenged to explain why solar thermal is cost-effective. To see how the discrepancy arises between what the panels produce and the oil we don't burn as a result, take a look at the figures above for oil versus sun input. b) getting much more (in July, nearly all) of that heat from the Sun. And that means that in summer our hot water is quite a bit hotter than it is in winter, which paradoxically means we use less of it since the use temperature is always lower than the tank temperature. Some of this is by choice, because we set the hot water thermostat for the oil boiler relatively low at about 55°C, while the solar panels, given enough sun, will heat our entire (200l) tank to their limit of 75°C. Our hot water tank is well insulated and we use most of our hot water in the morning when we shower or wash clothes. Ideally, the sun replenishes that hot water during the day, but the boiler will come on at around 18:00 to bring the tank up to temperature if necessary. For much of the summer it isn't necessary, and the tank insulation is good enough for a clear sunny day to provide hot water for more than just the following day, particularly since there are only two of us. Our daily consumption in January 2008 - when we had least help from the sun - can be taken as a measure of our actual hot water needs, and is around 3½ kWh. Our system is designed for a family of four, who might need 7kWh a day. Our solar panels could provide that extra 3½kWh for most of the summer - their maximum output in a day was 10½ kWh - but in winter we would probably burn (roughly) twice as much oil. So you could argue that our solar panels - whose output is about the same no matter how many users there are - would replace twice as much oil if there were four of us as they do when there are only two. But it's probably more accurate to say that the panels are designed for 4 people - because if there were 6 of us, they wouldn't save three times as much oil as they do today.